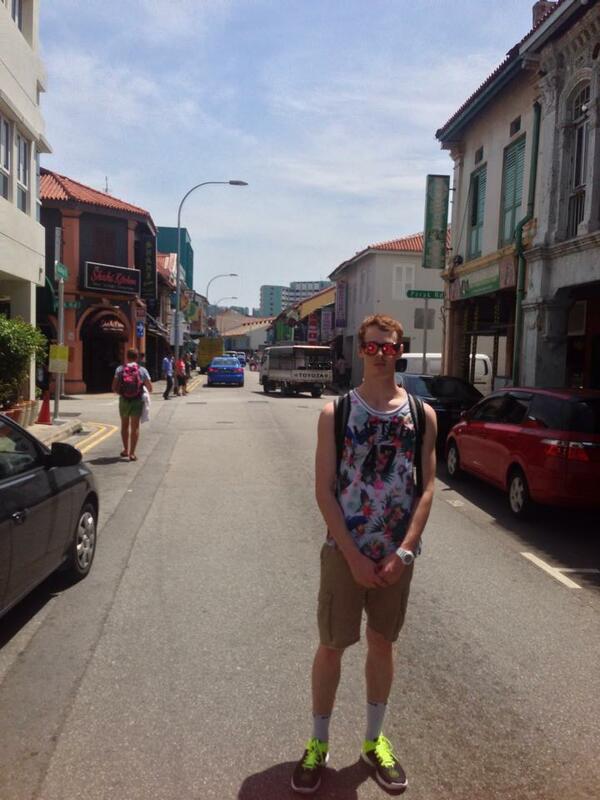 I spent a few nights in little India, in the backpackers hostel The prince of Whales. It was nice to relax after such a busy two weeks. A few of us who stayed there went shopping some more at Bugis, Mustafa, and Funan. I got the chance to go to the night safari at the zoo with two Danish backpackers, which was a really nice time. 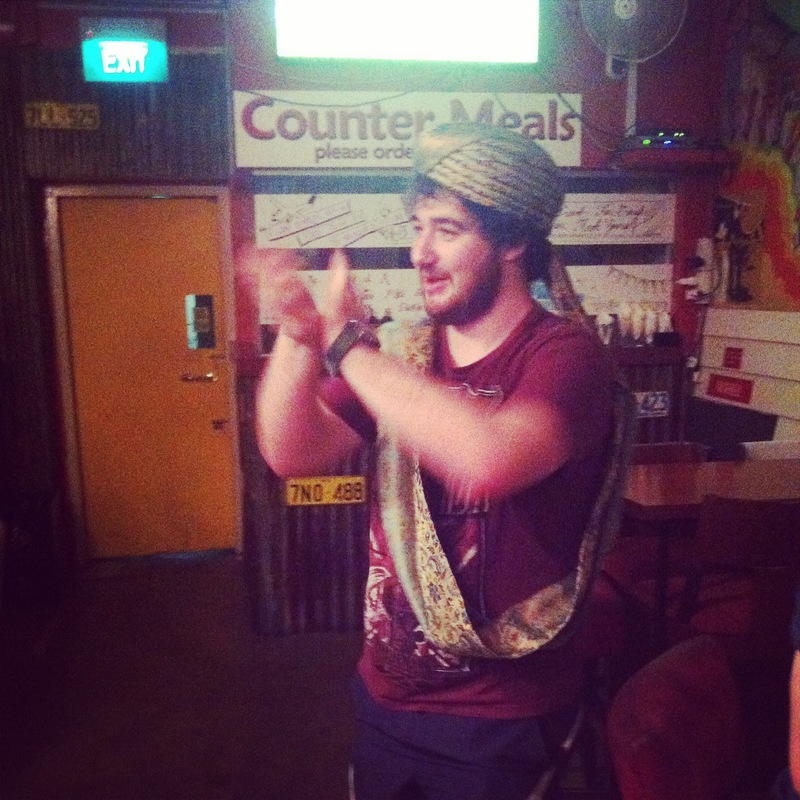 The atmosphere was very nice at the backpackers but I felt that it was time to return home. The last day: Sunday started way too early from the sleep I’ve had, but the weather here makes it possible. It is pretty annoying that as soon as I’m completely acclimatized to living here, food, heat, ect, I must return home. I am going to miss Singapore and the people I have meet on this trip. 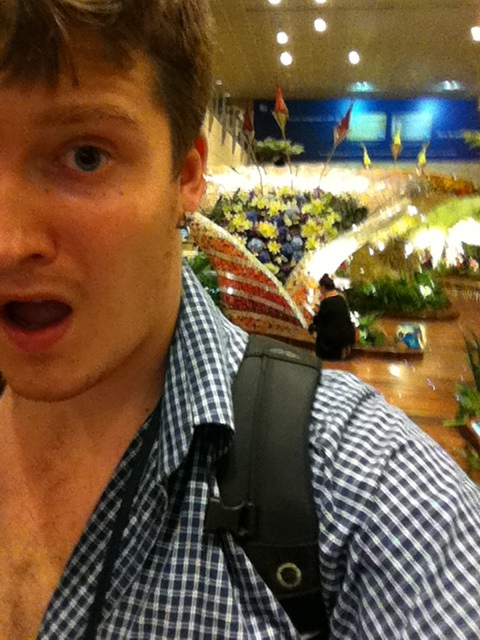 The day was spent at the airport, with its whole Koi ponds, butterfly gardens, free movie cinemas. 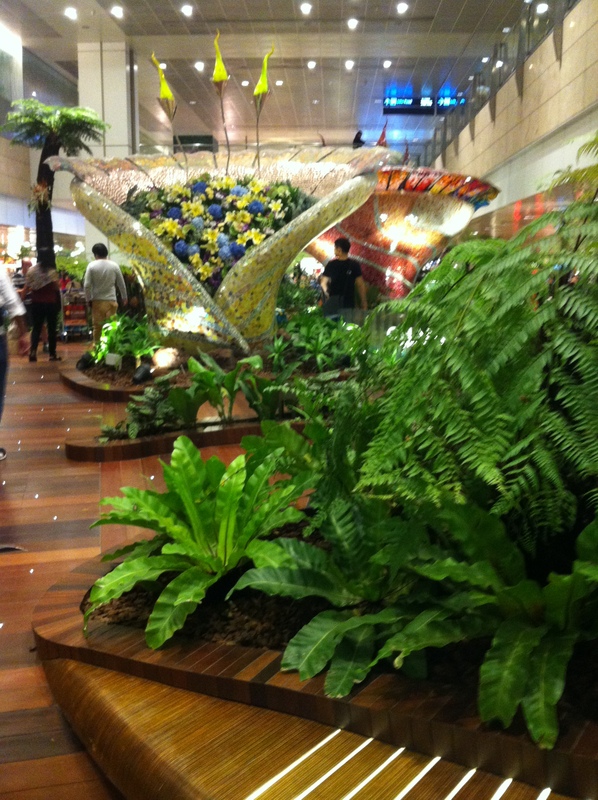 Singapore airport is an amazing place. I had a nice stopover in Kuala Lumpur, which was enough time off the plane for me to get some food and have a shower before getting onto the final flight to take me home to Melbourne. Melbourne was much colder than I expected when I got back, shorts and a T-shirt weren’t the best idea to land with. Regardless it was nice to be back home. Away from the hustle and bustle of the study tour, I feel that I have learnt a lot about Singapore, it’s science, and the fact that their is so much to be gained from international relationships and looking past our own boundaries to other lands which have so much to offer. We now live in an age of an international community; we should use it to its full advantage. I am very glad I have made these blog posts, I will be able to look back onto this in a few years and remember the experiences I have had in Singapore. Now I am back in Australia I feel as that nothing had changed here but that I have matured as a person, I must be more confident with myself, and i should work harder for the things I really want. Also better organisation wouldn’t hurt. Keeping a journal will help me remember what has happened, while also allowing me to attempt to improve my writing. I am planning to continue blogging my other adventures on my own blog. Cheers for following this blog, i hope you have enjoyed it. 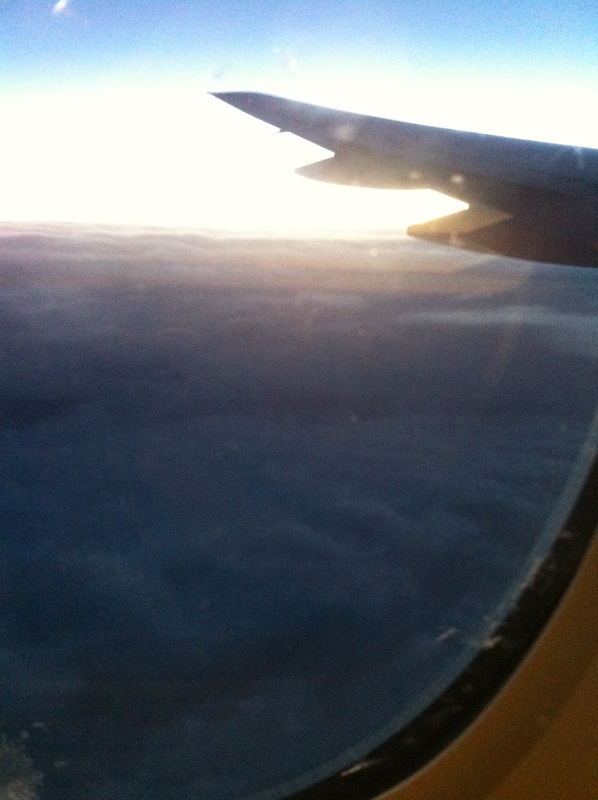 Sun over the clouds, almost home. 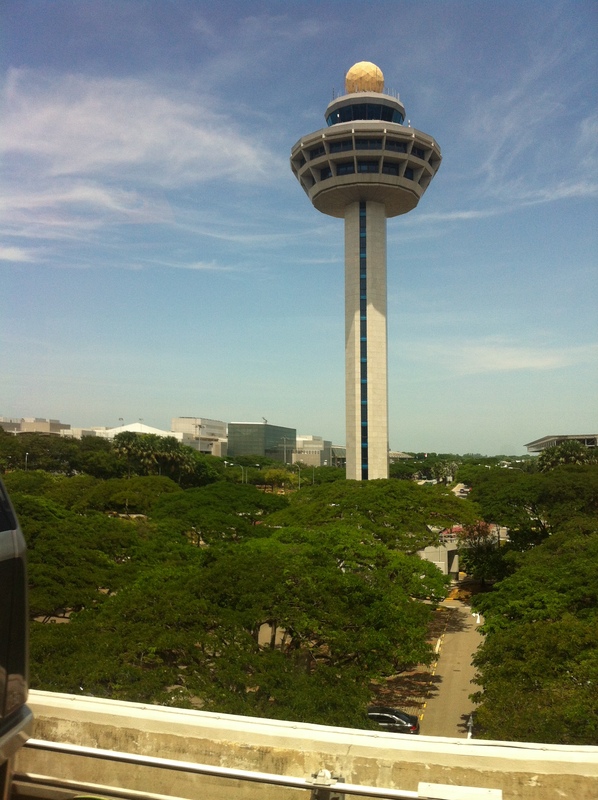 So long, Singapore… for now! This study tour has been a life changing experience. Not only have I gained an inestimable amount of knowledge on Singapore, but I have also had my first exposure to overseas travel. I feel that this experience has given me a much deeper insight into foreign culture than I could have ever gained in Australia. Looking back on the last two weeks, it seems like it was all just a blur. I have experienced so much in such a little amount of time; everything from lab tours to presentations, from the Singapore food culture to Singaporean governmental politics. 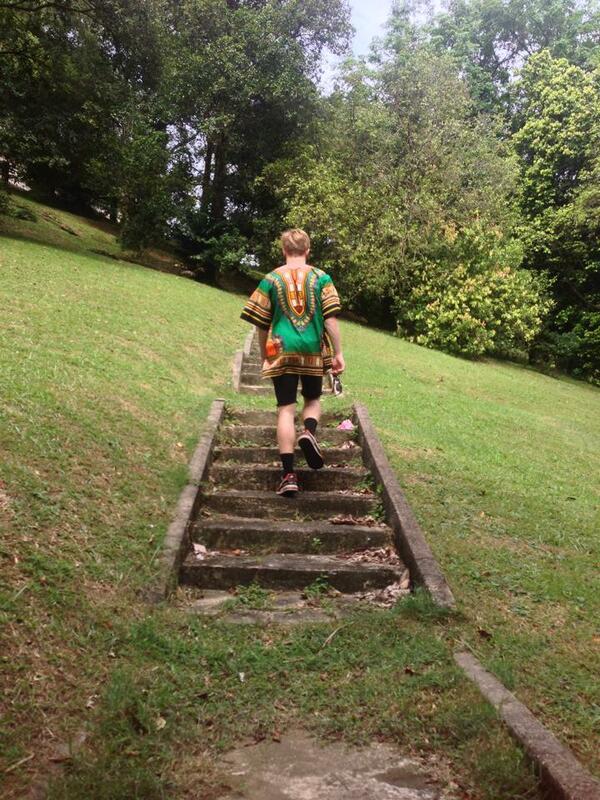 Looking back, I think it is safe to say that my expectations prior to coming to Singapore were not entirely accurate. Indeed, I could never have predicted exactly how it would feel to experience a foreign country, especially one as unique as Singapore. But despite everything, I am still very glad to be home. As much as I have enjoyed both the social and educational aspects of this study tour, by the end I was beginning to miss the comforts of being at home. But with that being said, I am almost certain that I will return to Singapore at some point in my life, perhaps even for a semester exchange program. So with that I bid you farewell, Singapore, until we meet again! 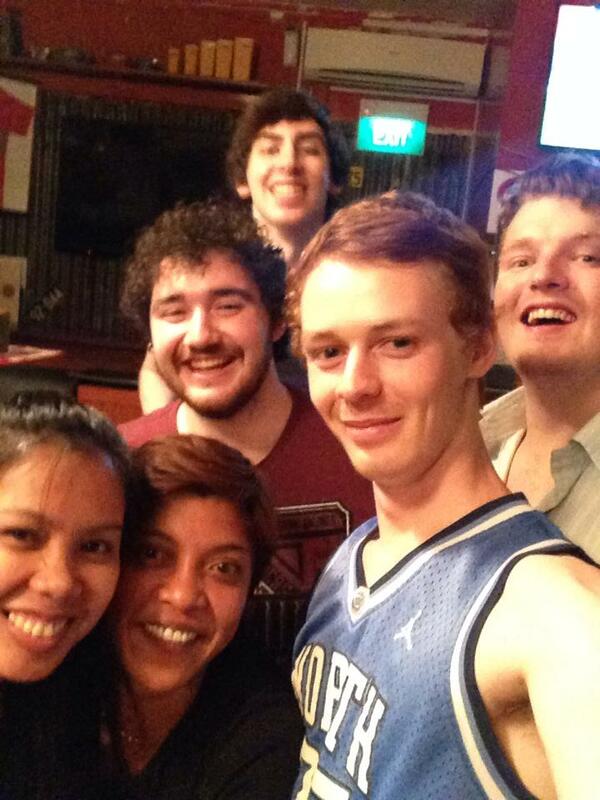 On Wednesday the 9th of July we had our final day of the La Trobe Nanotechnology Study Tour in Singapore. It was a really great day to end the tour on. First we started our morning by going to Biopolis, where we visited the Institute of Medical Biology (IMB) where we got to see some of their laboratories and then have an extremely intriguing presentation by Victor Nurcombe. Victor researched into stem cells, heparin glycosaminoglycan, and natural sugars. They were able to grow bones back using just the sugars in pigs, fish, rabbits, rats, and soon will have a human trial to see if it works in humans. After visiting IMB, we went to NUS’s surface science laboratories and the Singapore Synchrotron Light Source (SSLS) located in NUS. The SSLS was very interesting as it was such a small synchrotron, yet it was able to help so many different research machines that they had there. Our last stop for the study tour was IMRE where we started our study tour. 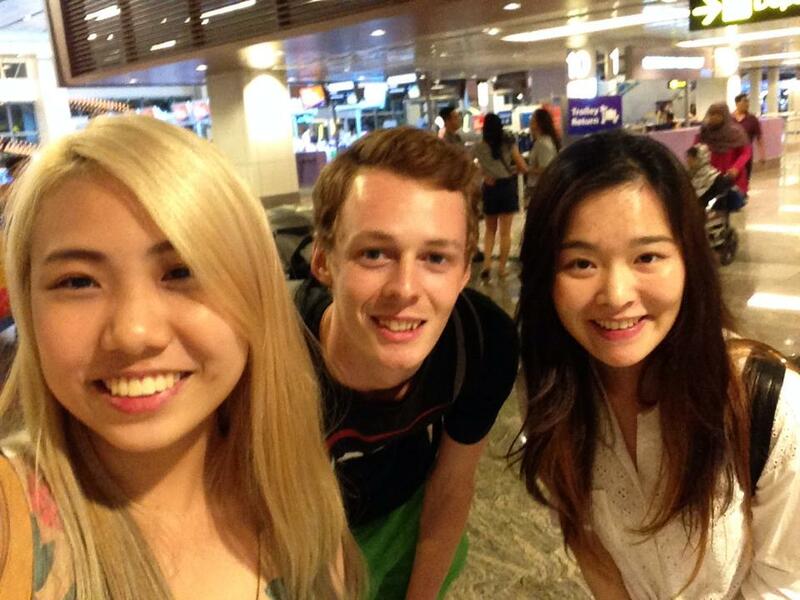 It was good to meet Sean again and to discuss our thoughts about Singapore then compared to when we first arrived. After some tea, coffee and hot milo, a good discussion and a goodbye, we signed off the study tour and said goodbye to Paul and Dongchen. Since the study tour finished I have travelled to Jakarta, and am now currently in Bali relaxing by the pool. I definitely needed this little holiday to relax after the two weeks of hard, but enjoyable work. 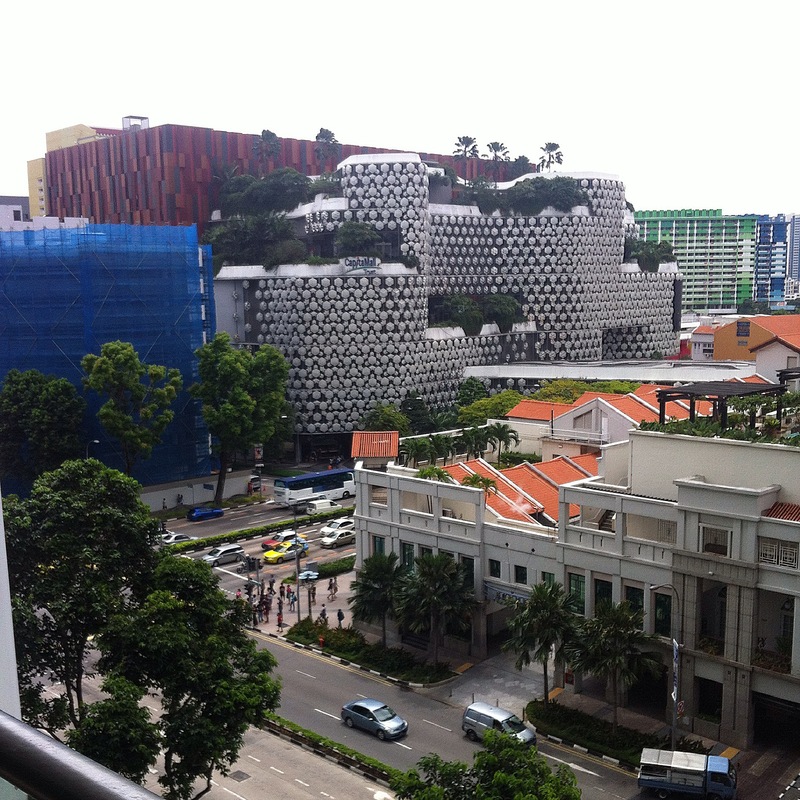 Biopolis and the final day. After an early night, I woke up at 4:00am to watch the Brazil & Germany World Cup match. Just after the 7:1 German victory, the sky’s above Singapore opened up to a torrential downpour with lighting cracking all around us. It was truly an intense experience to have purple lighting so close to us. By our meeting time of 8:20am it had slowed down to a drizzle. We took the shuttle bus to Kent ridge then the train to Bona vista, where we then walked for a few minutes to Immunos at Biopolis. Biopolis is an international research and development centre for biomedical sciences. Immunos is one of the buildings in the Biopolis complex which houses The Institute of Medical Biology (IMB). We were greeted and given a tour of their laboratories. Then we were given a presentation by an Australian Professor, Victor Nucombe who works at IMB. The presentation was about himself, history about Singapore, and the story of the company he is in/ how he got there.It was very interesting to know how Victor Nucombe got to where he currently is and the journey he has taken to get there. We were then taken down to the basement where they showed us their super-resolution fluoresce microscopes. Apart from being very beautiful, the images they take there are also useful scientifically. We then travelled back to NUS, to their surface science laboratory where we were shown their equipment and the Singapore synchrotron light source (SSLS). 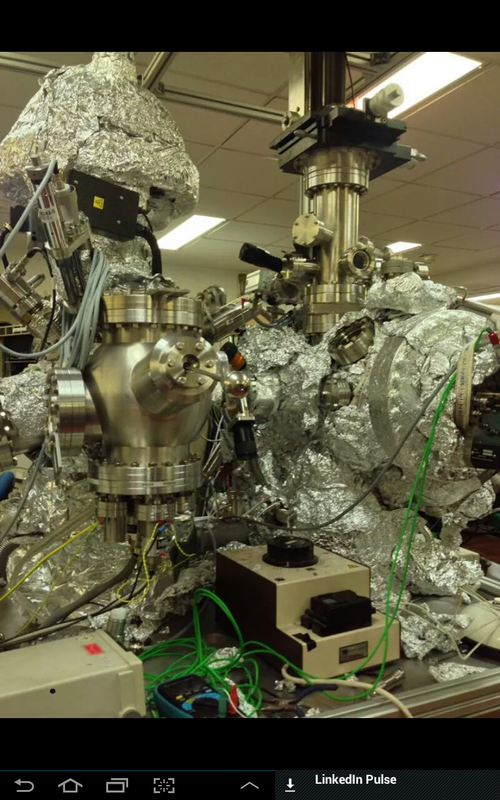 The SSLS is very small compared to the one we have at Monash, but it is still able to produce what is needed for experiments. After that visit we returned to IMRE where we once again had a sit down and chatted with some of the people there. From which we were then dismissed from the tour. I then continued my own adventures. The activities today were reasonably laid back and relaxed, as they were both specifically for tourists. In the morning, we visited Fusionworld, a subsidiary of A*Star that is designed to showcase some of the more ‘exciting’ recent scientific developments. We were shown various new technologies, including a computer game that is powered by brain wave activity and an interactive screen that is controlled using a laser pointer. I was particularly interested in the applications of these technologies. For example, the brain-wave game was designed specifically to improve the focus of children with ADHD, and there have been studies which have shown its effectiveness. In the afternoon, we joined once again with international students in the Biodiversity Group, and together we visited Singapore Zoo. We were given a ‘behind-the-scenes’ pass, and we were educated on how the zoo functions in order to keep the animals happy and healthy, including feeding procedures, veterinary services and general zoo maintenance. 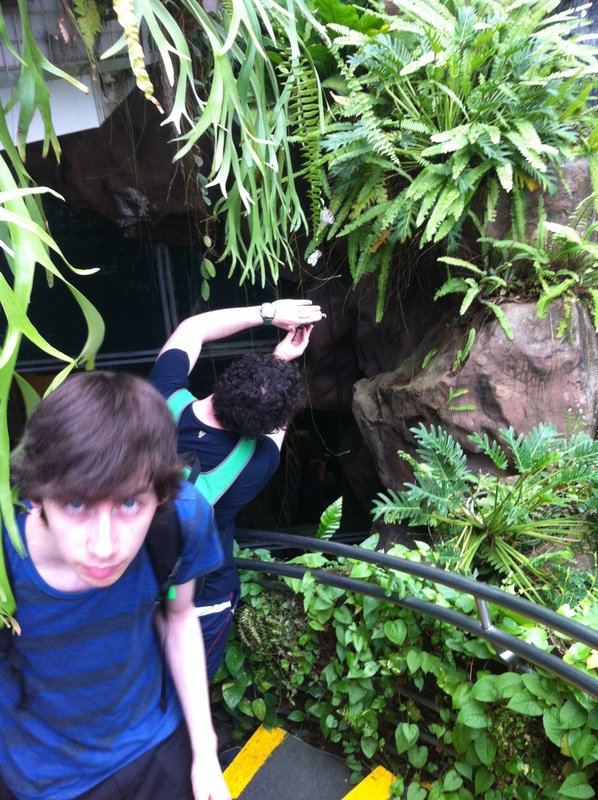 In addition, we also had some time to walk freely around the zoo and visit all of the animals. As with the aquarium, I will let the photos describe this portion of the trip!